Timothy will be talking about his time in Antarctica and the bond he formed with his pack of life-saving huskies, while Latin Vixen will be hosting a panel on fursuit construction. 2008 also sees the return of the popular boat party which started the event in 2006. Due to increased attendance estimates, RBW has had to yet again find a larger boat. 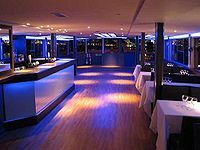 The Erasmus is one of the largest pleasure boats on the River Thames and is expected to play host to 310 furs over it's three floors from 8PM until midnight on the Saturday of the convention. Other events include the fursuit Commonwealth Games, and a charity auction. Last year, RWB's auction raised £1331.23 (~US$2662) for its chosen charity.